Suffolk County Crime Stoppers and Suffolk County Police Fourth Squad detectives are seeking the public’s help to identify and locate two men who used a stolen credit card at two different locations in July. 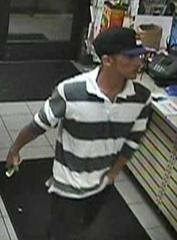 Commack, NY - September 4th, 2014 - Suffolk County Crime Stoppers and Suffolk County Police Fourth Squad detectives are seeking the public’s help to identify and locate two men who used a stolen credit card at two different locations in July. On Wednesday, July 2, 2014, at 2:18 a.m., a man entered a 7-Eleven, located at 362 Veterans Memorial Highway, Commack and used a stolen credit card to purchase merchandise. At 2:26 a.m., another male used the same credit card at the Candlelight Diner, located at 56 Veterans Memorial Highway, Commack. Subject: LongIsland.com - Your Name sent you Article details of "Man Wanted for Using Stolen Credit Cards in Commack"